Arthur Online plays a fundamental role in our ethos of providing top class accommodation and student care, promoting good communication and transparency with all our tenants. Arthur Online has really helped us to be more efficient and organised. Overall it has greatly improved our staff’s productivity, freeing much of their time previously spent on administrative chores. After implementing Arthur, we now have a reliable solution, that has helped us achieve our growth targets. 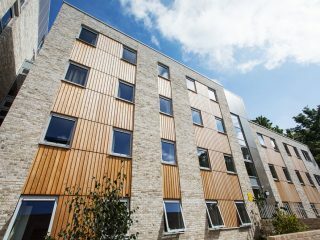 We are an award-winning student accommodation provider with over 3,350 student beds in our UK portfolio. We currently own a mixed portfolio of Halls of Residence, apartments and Houses in Multiple Occupation (HMOs) throughout the UK. What are your biggest operational challenges? As we expanded our portfolio, we struggled to cope with an increasing number of applicants who scheduled viewings, increasing the amount of paperwork for hundreds of newly approved tenants. Contracts needed to be manually tailored for many of the new tenants daily, the administrative burden was immense. Students were not always able to come in to sign their tenancy agreements, delaying the move-in process. Managing workorders for hundreds of students became increasingly challenging as we expanded. This meant that we needed to have staff members spending a lot of time on calls and answering emails from students who were reporting hundreds of issues daily. Our former system consisted of time-consuming procedures where issues had to be logged on disconnected systems manually. Handling all communications via email meant that messages were often lost and subsequently very difficult to retrieve. How has Arthur Online helped you overcome these challenges? Arthur Online has helped us to significantly reduce our paperwork. Documents and certificated can be signed digitally and stored within the app and are accessible to tenants and managers at any time. Furthermore, we were able to automate and streamline most of our onboarding processes and communications, freeing up our team to focus on more urgent tasks. Arthur Online allowed us to be more efficient and organised. All the property management is centralised, so we don’t have to manage the various parts of the process with disconnected systems. Our contractors finally have access to all the information required to carry out tasks and update the relevant parties directly from the app, without having to travel back to head office to type up notes. Having an automated workflow system has improved our efficiency and enabled us to deal with maintenance issues in record times; our tenants have never been happier. After an extended due diligence process, we trialled a small number of properties. The Arthur team helped with uploading our data to the platform which was ready to use in a couple of days. We ran dual systems for three weeks before fully implementing Arthur Online at the beginning of March 2017. We then joined a public training day with the Arthur team in Paddington to get the most out of the system. You’ve been using Arthur Online for a while now, what do you think of their ongoing customer support? Arthur offers high quality support via their live chat; most of the time we dealt directly with Marc Trup who has been our main relationship manager since we implemented the system. Arthur provides training to our new employees on a regular basis, ensuring our staff members use the system to its full potential. How much has your business grown since you started using Arthur Online? We have continued to grow and add more venues to the system since 2017. After implementing Arthur, we now have a reliable solution, that has helped us achieve our growth targets. Arthur has greatly improved our staff’s productivity, freeing much of their time previously spent on administrative chores. Arthur also plays a fundamental role in our ethos of providing top class accommodation and student care, promoting good communication and transparency with all our tenants. How much time has Arthur Online saved you and your team? Since we started using Arthur Online the time spent on administrative tasks has been cut down by more than a quarter.